As I’m writing this post, it’s truly a race against time. It’s a race against time, because I’m sick and in that “I can’t keep my head up any longer” phase of sickness. I knew I should’ve written this post last night, but I got home too late and I went straight to bed. It was an exhausting weekend, but a productive, fun one. Having said all that, there is no way I’d let today go by without this recipe, which is my new favorite way to eat a sandwich. To quickly recap the weekend, Saturday started off early with about 4.5 hours of registry shopping (wedding registry!) While it was fun, it was tiring for sure – should we register for the gray plates or the soft gray plates? Should we go all-clad or stay with non-stick? Should we get a new toaster? These are the questions you find yourself asking when you’re registering. We went to The Mall at Short Hills, which is definitely the country’s best mall (I’ll fight to the death to defend that!) and did three stores (again, exhausting!) – Crate & Barrel, Williams Sonoma and Macy’s. But heck, at least we’re done! Then Sunday I ran a million errands, made this recipe (and devoured it for lunch), cleaned up the apartment and then went wedding dress shopping (for the fourth time) with my mother and sister at Kleinfeld’s (for the second time)… and I found the dress!! So you see… a productive, but jam-packed weekend. I woke up this morning all achey, so I’m going to drink a lot of fluids and rest. I apologize in advance if I’m slow to respond to your e-mails or social media. 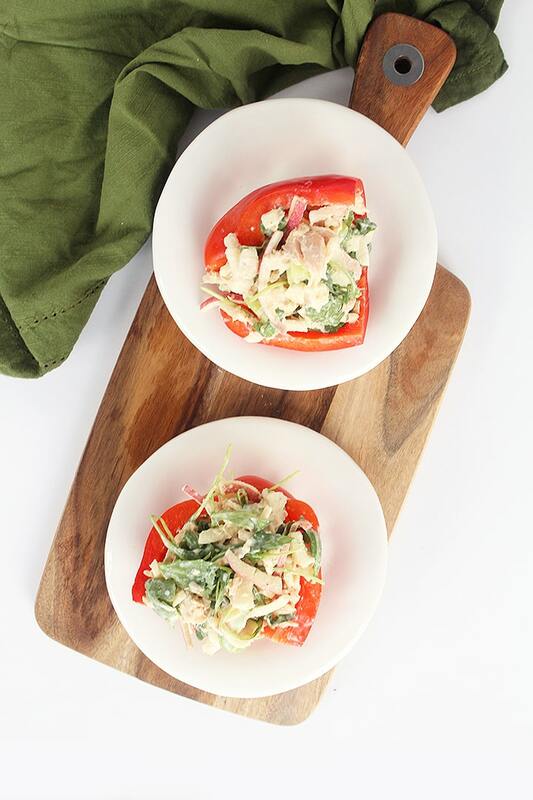 This recipe: the combination of sweet apple, mild Greek yogurt, crunchy celery and the savoriness of the tuna is unbeatable. 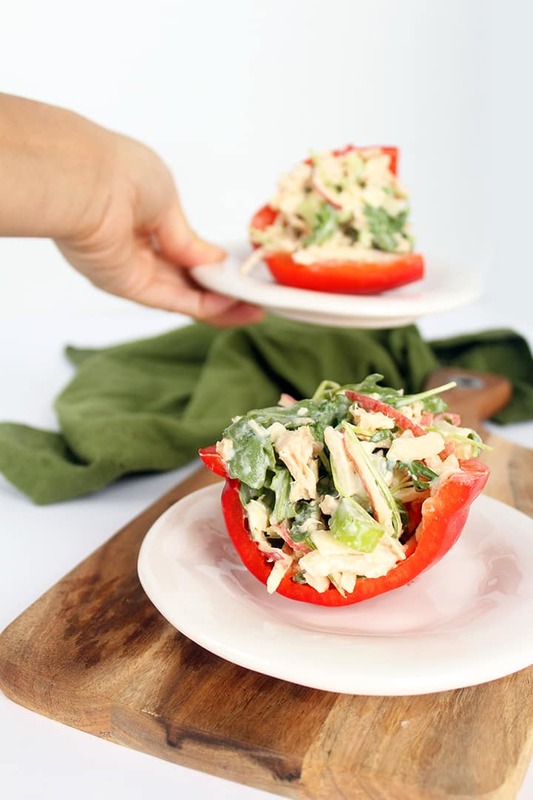 You can make a big batch of this and enjoy it as a salad or you can stuff it in bell peppers for an added crunchy, refreshing bite! This keeps very well in the fridge, so make a big batch and have it for lunch this week! What are your favorite ways to replace the bread in your sandwiches? Combine all of the ingredients for the fayonnaise together in a small bowl and whisk until combined. Set aside. Slice the apple halfway lengthwise and spiralize it, using Blade B. 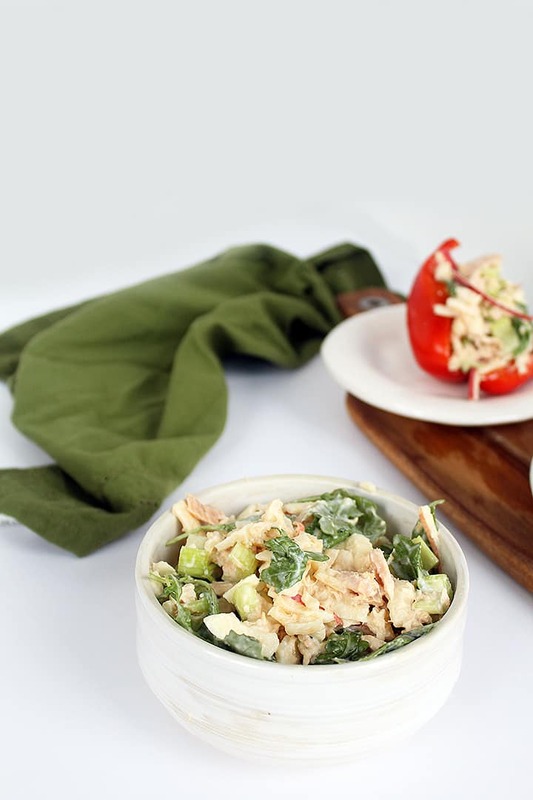 Add the apple to a large bowl with the celery, arugula, tuna and fayonnaise. Toss to combine thoroughly. Slice the top off of both the bell peppers and slice in half. Deseed and remove any of the white inside flesh. 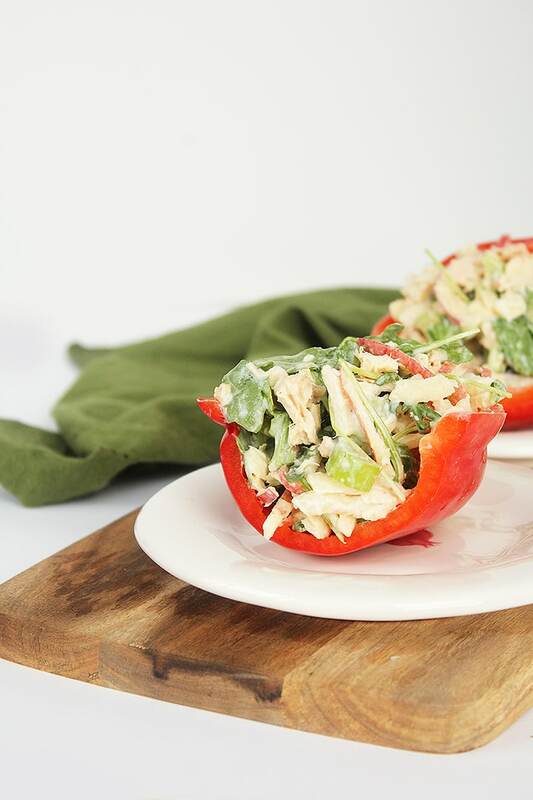 To assemble the sandwiches, fill each bell pepper with the apple tuna salad. Hope you feel better soon. This looks yummy! Do you have android app? All I see is ios. I'm sure you have a lot of android fans. Thanks for the great recipes. Feel better! This looks amazing. I can't wait to try it! Congratulations on finding your dress and getting your registry shopping done. This recipe looks great, and I appreciate that you took time to post it. I hope you are feeling better soon! GIrl, you are a wedding planning MACHINE. It took us MONTHS to get a registry together. Months. Plural. Hope you feel better soon! If all this bell pepper sandwich doesn't cure you, I'm not sure what will! Ahhhh... from one Jersey girl to another, I must say that the Short Hills mall is the most amazing place to get your registry done! Others just won't understand :) Oh- and I can't wait to try your fayonnaise- looks like an awesome addition to tuna! How about making this with shredded chicken instead of tuna? For some reason, no matter how hard I want to I can't bring myself to eat tuna!! I want to love it...I really want to love tuna...but I can't. Shredded chicken would work very nicely here!! I just finished scarfing his down. What a tasty recipe, and I get to eat it three more times! I might add some fresh diced jalapeños and top with toasted sunflower or pumpkin seeds. You could even top with a slice of cheddar, throw it under the broiler and enjoy a tuna melt. I made this for lunch today. I thought the calorie count seemed a little low for 1 serving to be a meal, but I was stuffed after! The fayonaisse was awesome! Hi Ali, Just saw this and it looks delicious, but I have a seafood allery, do you think canned chicken would work?